Things have been a bit crazy this past week and I have a ton of things to update about. I was incredibly lucky to win a wristband to see Jay Manuel premiere his new line Attitude at Sears last Tuesday (Karen of Curvy Canadian also attended!) and I will be blogging with my review later on this week. 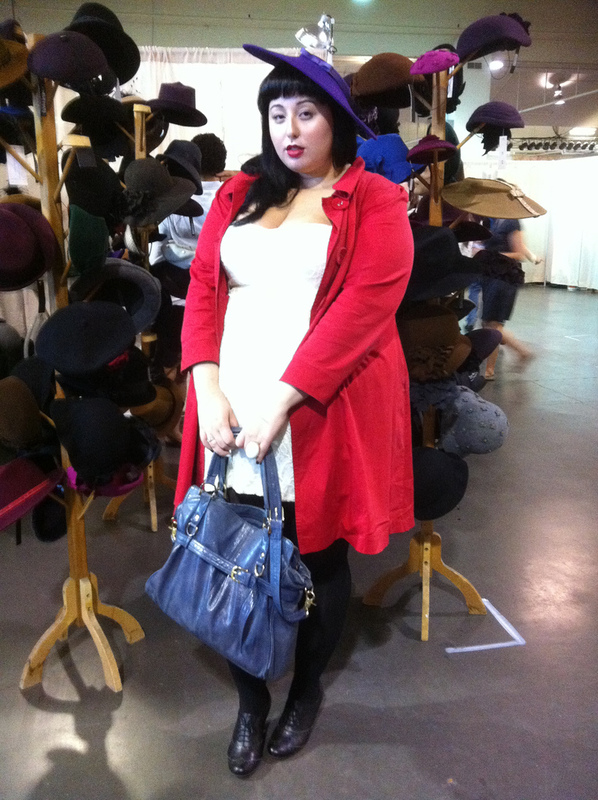 For now I bring you an update about my first ever experience going to The Clothing Show in Toronto. I’m a bit embarrassed to admit that I never even knew The Clothing Show existed before this year but I’m glad Karen (can you tell we hang out a lot? haha) brought it to my attention. I went in with little to no expectations but I was so pleased to see what was waiting for us inside. 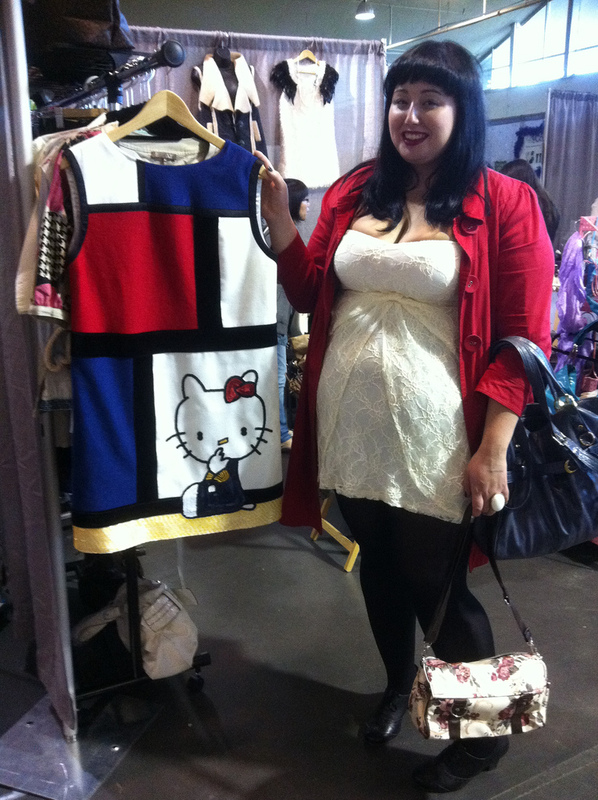 For those who don’t know The Clothing show is Canada’s largest vintage and independent designer show. Here’s a description right from their website! For over 33 years The Clothing Show has been serving up a delicious mix of unmistakably inventive local “must have” lines of apparel & accessories. Catch runway shows throughout the weekend, featuring local designers. Shop from more than 300 booths from the Local Canadian Designer, Streetwear, Vintage and Sample Sales Sections and find a vast selection to suit anyone’s fancy. Whatever your delight, The Clothing Show is the one stop, full weekend shopping experience for everyone! I had originally gone with my heart set on watching the fashion shows. 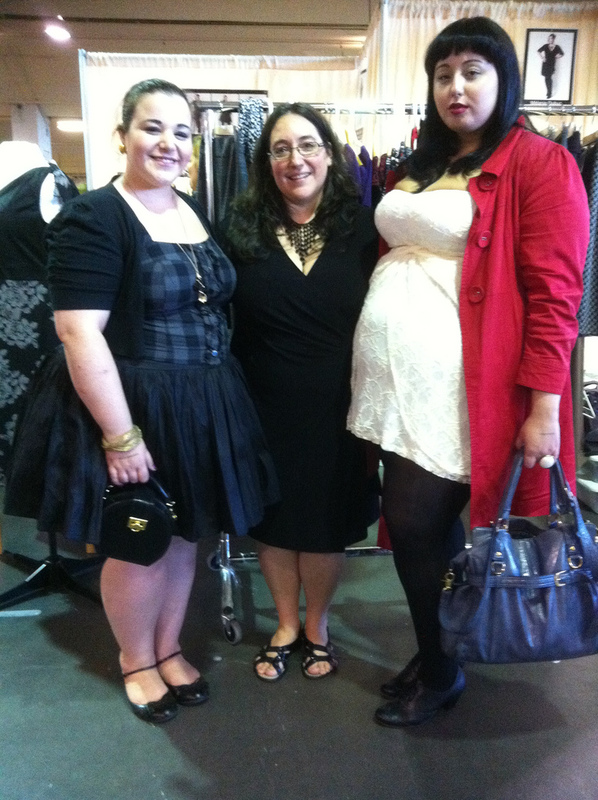 Karen spoke so highly of Ashaki Charles and I knew I was going to enjoy discovering new Canadian plus size designers. The exhibit isn’t exclusive to plus size retail but it certainly does include and promote the existing and upcoming local talent. I’ve already made a mental note to save up a ton of cash for next year’s show. I overheard someone say that The Clothing Show is where they purchase a lot of their best pieces and now I know exactly what they mean. I saw so many unique, creative and well crafted items. It broke my heart just a little bit to walk away from all the things I couldn’t afford. Do you ever walk into a mall or store and just get overwhelmed with everything that you want to buy? Realistically you can’t really afford it but you’re suddenly dreaming of the many different ways you could go about affording the gloriously beautiful things you’re witnessing? Thats exactly how I felt when I walked into the venue on Saturday. My mind couldn’t exactly process just how much I wanted to snag up everything and keep it close to my heart forever and always. I think my favourite part about getting to attend this event was realizing that maybe Toronto did have a lot of what I was looking for as a fashion junkie. Though not everything I loved was offered in my size I could see the change before my eyes. I met a few lovely ladies who were incredibly eager to hear Karen and I talk about our roles in the plus size community and are willing to take suggestions from us for their clothing rental store (Rent Frock Repeat). 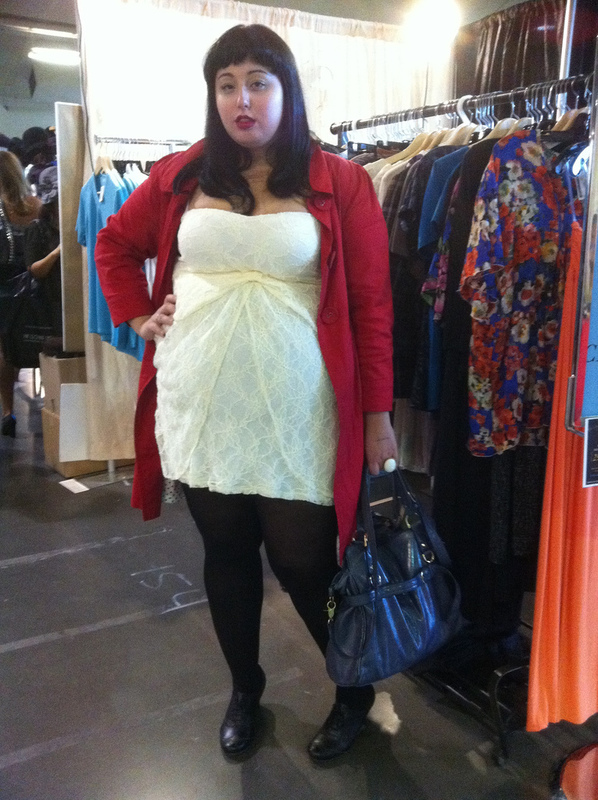 We also met Mélanie Dubuc, an independent Quebec designer who has her very own chic plus size line. 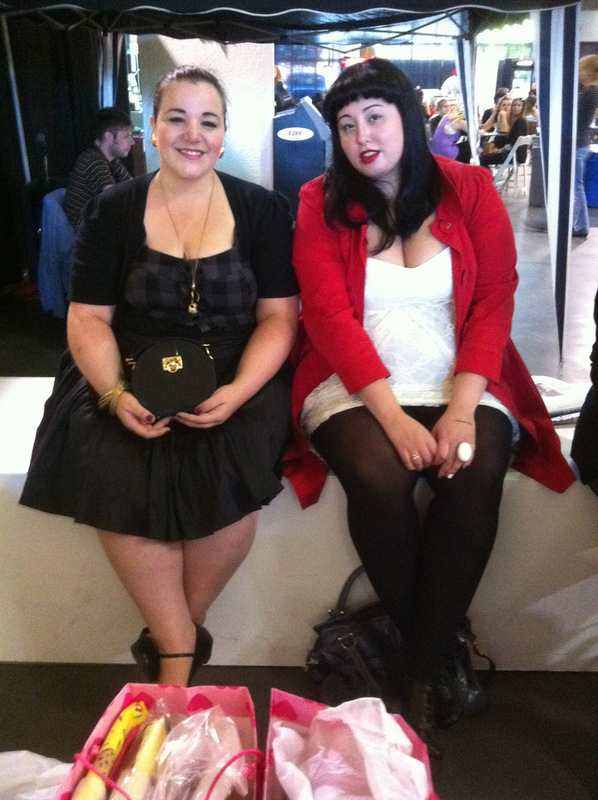 She was so sweet and even more excited to know that we were plus size fashion designers. Mélanie Dubuc’s designs also appeared on the runway where she showcased a few pieces I intend to get my hands on as soon as possible. I fell madly in love with her houndsooth skirt and my heart has been taken since! Unfortunately I left my handy dandy camera at home so I wasn’t able to take proper outfit photos but Karen was kind enough to take a few on her iPhone for me. A lot of the pictures didn’t really catch the detail of the lace on the dress but I managed to find a few that turned out well. I’ve been iffy about this dress since the moment I received it. I’m not entirely sold on strapless dresses only because I haven’t really found the perfect strapless bra to go along with them. I’m really thankful that I didn’t sell this dress when I had the chance to months ago because I’m really realizing how lovely it is. I still need to hunt down the perfect accessories to go along with it but keeping my trench on the entire day helped give it an extra kick. love it! The dress looks great on you! First off, love the colours in your outfit, the red lipstick brings it all together 🙂 I've never heard of the clothing show before but it sounds really cool. Maybe next year I'll go! Goodness gracious, you are gorgeous!